I’ve been met with confused looks and silence when I’ve asked friends to guess what’s in my choice avo mousse, because it tastes so close to the real thing they can’t tell the difference! The rich creamy texture of the avocado makes it the perfect base for a delicious, guilt-free dessert. 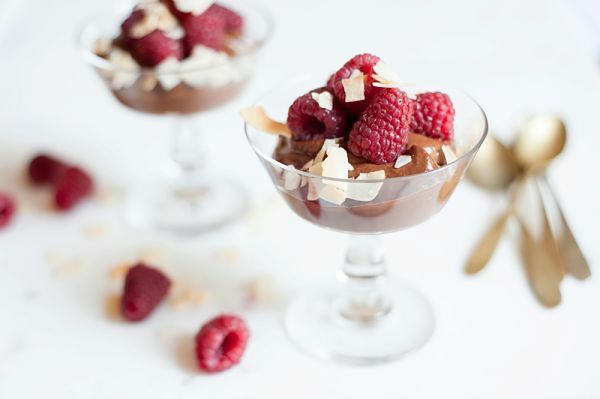 And there’s lots to love about raw cacao. It’s a potent source of antioxidants, lowers blood pressure, reduces your risk of stroke and cardiovascular disease, protects your nervous system, lowers insulin resistance and may even reduce the risk of certain cancers. As if that’s not enough to get you across the line, it’s high in essential minerals including magnesium, zinc, iron, copper and calcium, and contains a stimulant that releases endorphins that boost your mood. I’ve used rice malt syrup as the sweetener, because it’s fructose free and has a low glycemic index (GI), which means the energy releases slowly into your bloodstream (when used in moderation) instead of causing blood sugar spikes. If you’re not fussed about fructose banana tastes pretty yummy too! 1. Combine all ingredients in a mixing bowl and blend with a hand held blender until you get a smooth and creamy texture. Taste and adjust the flavour if you need to. 2. Serve with fresh berries – pomegranate, shredded coconut and buckwheat would go well with this too. Very keen to try this one Za! Could you make it in a normal blender? Yes you absolutely could Marina, enjoy it! While at first avocado and chocolate might not seem like the most compatible couple, after multiple taste tests, we can assure you that this fairly odd couple is in fact a match made in healthy heaven. The concept of combining sweet and savoury is fast gaining popularity, and the combination of creamy avocado mixed with smooth chocolate is definitely something you ll want to get on board with. The perfect breakfast, dessert or even snack, this chocolate avocado mousse courtesy of our friends at Oh My Goodness will seriously satisfy.